There are a lot of rumors on Social Media that SSC CGL Tier-1 2016 has been canceled and will be conducted again which is completely wrong. 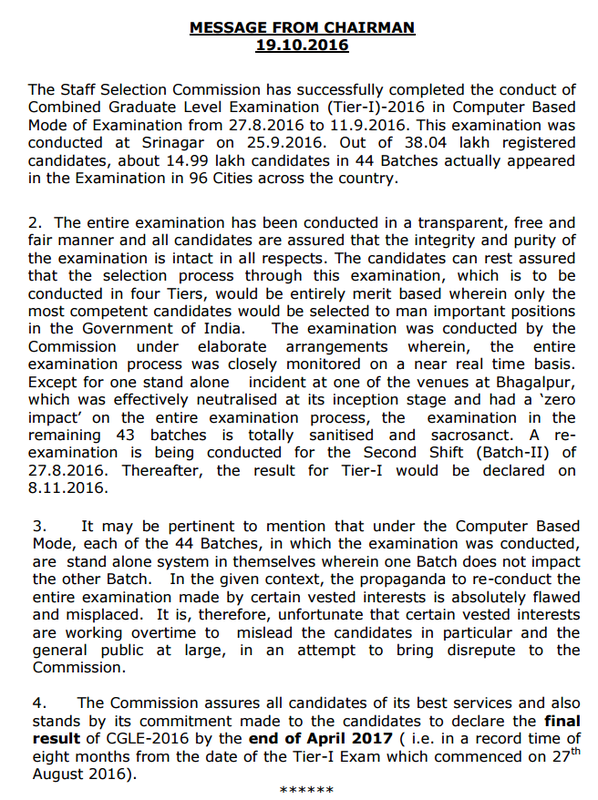 The actual news is, SSC is going to conduct the Re-Exam for only those candidates who appeared in the 2nd shift on 27th September 2016. The reason for this is, some malpractices were reported from an exam center at Bhagalpur. Avoid these Rumors and focus on your preparation for Tier-2 which is likely to be conducted from 30th Nov. to 2 December 2016. According to the official statement by Mr. Khurana, there won't be any delay in the recruitment process this year. The result of Tier-1 will be declared on 8.11.2016 and the final result by the end of April 2017. The screenshot of the official notice has been attached below. You can also download the pdf file by clicking on below given link.